Product and ordering information for the Transferpette® S air displacement pipette; single and multichannel adjustable volume pipettes, fixed volume pipettes, starter sets. Q1 Promotion – CLICK HERE for details! The Transferpette® S is the product of intensive ergonomic and operational studies, and the application of innovative materials. 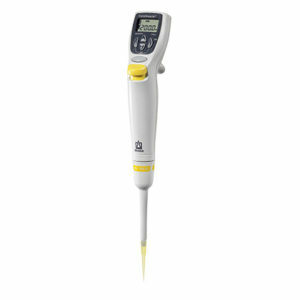 It is the perfect manual pipette for demanding laboratory scientists who prefer a traditional control layout. The Transferpette® S offers robust yet lightweight construction, superior autoclavability, simple, one-handed operation, high degree of accuracy and precision and Easy Calibration™ technology for long lasting reliability. The single channel model is available in fixed volume and digital models in volume ranges from 0.1µL to 10mL. The multichannel model is available in 8- or 12-channels in volume ranges from 0.5µL to 300µL. Transferpette® S Single Channel pipettes are supplied with performance certificate, operating manual, shelf mount, and three year warranty. Transferpette® S Multichannel pipettes are supplied with performance certificate, operating manual, shelf mount, two tip boxes, reagent reservoir, pack of replacement v-rings, and one year warranty. 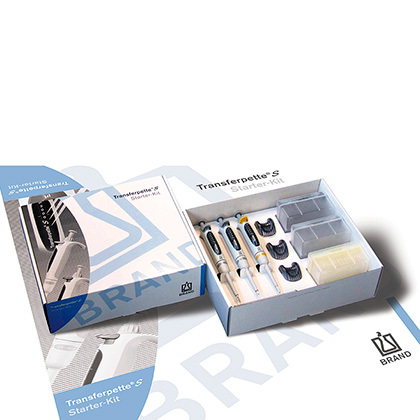 Transferpette® S Single Channel Starter Sets are supplied with three pipettes with performance certificates, operating manual, three shelf mounts, three filled Tip-Boxes with appropriate sized tips, and three year warranty for each pipette. *The value of accuracy and coeffficient of variation are final test values referring to the delivered nominal volume, instrument and distilled water at equilibrium with ambient temperature (20°C/68°F) and with smooth operation. What is the pipette housing made of, and how chemically resistant is it? The bulk of the pipette housing is made of polypropylene, which is the same material that pipette tips are made of. If you can pipette it, you can splash it on the housing. However, in general, it's not a good idea to soak a pipette housing in solvents for cleaning. What does "corrosion resistant design" mean? The pistons of many pipettes are made of stainless steel. If this corrodes, the volume of the piston changes, and the pipette becomes inaccurate. The pistons on most of our pipettes are made of glass or composite materials, which will not corrode. The ultra-micro sized Transferpette® models have a stainless steel piston, as glass is impractical in such small sizes. What tips fit your pipettes? 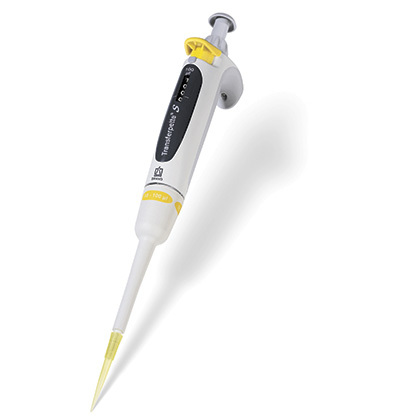 The tip cone on the Transferpette® S single channel pipette has a unique design that fits many brands of pipette tips. 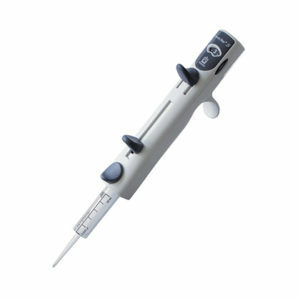 The multichannel Transferpette® S pipette has a V-ring design that also fits most major brands. However, because there are a large number of tip manufacturers, some of whom privately-label to distributors, it can be very hard to determine if a specific tip will fit properly. Also, some brands of pipette tips are made with poor quality control and materials, so the tips do not consistently fit. For non-BRAND tips, we suggest asking the manufacturer for samples. It should be noted that BRAND makes a very high quality tip, competitively priced, that will deliver the best performance for your BRAND pipette. BRAND's 5mL tips and the Finnpipette 5mL tips, and BRAND's 10mL tips and the Eppendorf 10mL tips, can fit on each other's pipettes. BRAND tips will also fit most Gilson, Rainin, Eppendorf and Finnpipettes, but tip fit should always be tested as pipette manufacturers periodically make product modifications that can impact tip fit. When switching brands/pipettes it may be necessary to recalibrate the instrument. Are your pipettes individually calibrated? Yes, they are. All pipettes and Titrette® bottletop burettes leaving the factory are individually tested for accuracy and precision. Only the Dispensette® bottletop dispensers are lot calibrated. How often should I calibrate my pipette? It depends. We recommend that the Transferpette® S be calibrated at least every year. However, as part of any continuous quality assurance process, if the instrument requires significant adjustment, the interval should be shortened. Why don't the fixed volume models have the Easy Calibration™ adjustment system? The volume display mechanism is an integral part of the Easy Calibration™ adjustment. Since there is no volume display, the fixed volume Transferpette® S must be adjusted the "old fashioned" way, like all the other pipettes on the market. How should I calibrate my 0.1-1µL pipette? Very few laboratories have the proper balances or a controlled atmosphere room required to perform a proper calibration of this pipette. Customers should be aware that many "professional calibration facilities" do not have adequate facilities and skills to perform this calibration. One facility that does is TTE Laboratories Inc in Hopkinton, Massachusetts. The volumes dispensed by my microliter pipette are very small. How can I compensate for evaporation? Capillary tubes can be placed on the balance, and the distilled water can be dispensed into them. This will reduce the surface area substantially, allowing a reading to be taken. They can be ordered from us using catalog number 708462. How do I order replacement V-rings? If you have the operating manual that was provided with your instrument at the time of purchase, the catalog number for the replacement V-rings is listed under Spare Parts. If you no longer have the original operating manual for your instrument, please contact Customer Service at 888-522-2726 with the serial number of your instrument. Why are the ejection buttons different colors? The colors of the ejection buttons indicate which tips fit on the pipette. The colors are: Light gray - ultra-micro tips; Yellow - 200µL and 300µL tips; Dark gray - 1,000µL tips; Red - 5mL tips; Royal Blue - 10ml tips. 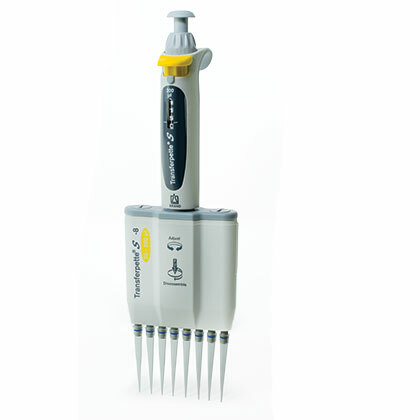 Where is the serial number on my Transferpette® S single channel pipette? The serial number is behind the tip ejector button. Push the tip ejector button down, and you will see it. Note: Instruments manufactured from late April 2018 have the serial number located on the back of the upper housing (dark grey area) of the pipette. My Transferpette® S makes a clicking noise when I try to adjust the volume. 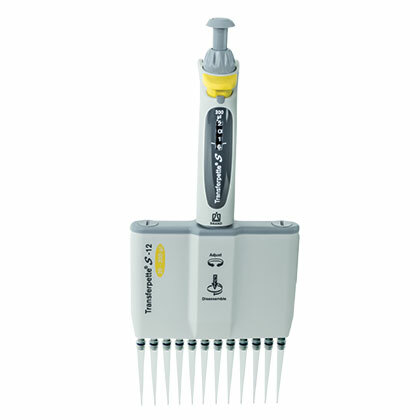 The Transferpette® S has a volume adjustment brake that is intended to avoid inadvertent volume adjustment when pipetting. This is a small light gray slide located between the faceplate and the volume adjustment wheel on the front of the pipette. Simply slide it toward the volume adjustment wheel, adjust the volume and slide it back down to secure the volume setting. This can easily be performed one-handed. What is accuracy, and what is precision? Accuracy is how close to a desired target value a test result is. Precision is how close a series of test results are to each other. What do "calibration", "gravimetric testing", and "adjustment" mean. The word calibration gets used incorrectly quite a bit, even in our own literature (we�re working on it). Calibration actually refers to the act of measuring results from an instrument, and determining its accuracy and precision. Gravimetric testing is one method of performing calibration. In the case of liquid handling instruments, it usually means the repeated weighing of dispensed amounts of distilled water (water free of impurities). Distilled water has a defined density at specific temperature and atmospheric pressure. By knowing the mass of water dispensed, it is possible to know the actual volume dispensed, and from that, determine the accuracy and precision of the instrument. Adjustment is the physical changing of the instrument that was calibrated. This can be in two ways. The conventional way is to change the volume dispensed to represent more closely the display. This requires at least two, usually more calibrations. One to check the instrument, another to check the instrument after adjustment, readjustment of the instrument if the first correction was done improperly, and so on. The second way, the way BRAND does it, is to change the display to accurately show the actual amount dispensed. This requires only one calibration, as no physical change is made to the dispensing mechanism. Does temperature make a big difference in gravimetric testing? Yes, it does. Ideally, calibrations should be done in a climate controlled room. At a minimum, when the calibration is performed, temperature should be recorded with a thermometer having a measuring error of max. ± 0.2°C. Does atmospheric pressure make a big difference in gravimetric testing? Not under most cases. EASYCAL™ allows for this to be adjusted for use in extreme cases, or if required by the customer's SOP. All through the catalog, it mentions that the "Standard Operating Procedure" for instrument calibration is available. How do I get one? The SOP's for the Transferpette® S are available right on this website (see links below). Additionally, all of the SOP's for BRAND's liquid handling instruments, as well as the BLAUBRAND volumetric glassware, are compiled in EASYCAL™ 4.0 for easy reference. Pipette Stands and Shelf mounts - Benchtop and wall/shelfmounts for convenient storage of pipettes. Autoclavable Reagent Reservoirs - 60mL, PP reservoirs with lids, available non-sterile or sterile. 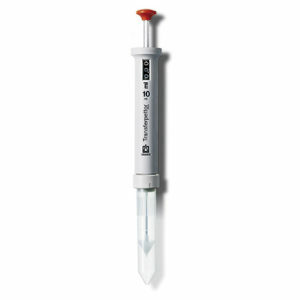 Filters - Replacement filters are available for 5mL and 10mL single channel pipettes. Single Channel Pipette Spare Parts or Multichannel Pipette Spare Parts - A full listing of spare parts can be found in the operating manual provided with the instrument. For assistance, contact BrandTech® Customer Service.